I'm gonna cut right to the chase. Everyone knows you've always wanted to be president. You campaigned ferociously in 2008, and I faithfully supported you, as did 18-million other Democrats. In fact, you garnered more popular votes (48%) than your rival Barack Obama (47%), who beat you by amassing more delegates. So now you're faced with a huge dilemma: enter the 2012 race or wait until 2016. I think I speak for millions of Democrats in saying your time is now. Democrats, especially the progressive Obamacons who were the president's most loyal supporters on his road to the White House, are extremely frustrated and angry with him and his administration. They were promised and expected "change you can believe in" and instead got "change that never came." They were told to "hope" and now they're being told how awesome it is that we have "the largest spending cuts in history" as if that is a fulfilled campaign promise. They thought they were buying a new model of Democratic leadership and were instead sold a used version of centrism and ideological abandonment. And now they want change, alright, and it's in the form of someone else. For Democrats, it's no longer "change we can believe in," but "a candidate we can believe in." Democrats want someone who has a vision for America. Someone who knows what he or she believes in. Someone who is ready to fight like an animal to push that agenda through. Someone who isn't afraid of Republicans. The world has changed drastically since 2008. Our nation's economy still struggles, as do the 14-million people who are unemployed. The global economy is no better. Oil and gas prices are at record levels, as is America's budget deficit. While corporate profits are sky high, consumer confidence is anemic. We're now embroiled in three wars, and there's unprecedented volatility in the Middle East and elsewhere. And now we have a Republican-controlled House of Representatives that seeks to decimate funding for Social Security, Medicaid, Medicare, Planned Parenthood, the Environmental Protection Agency, energy, the arts, education, scientific research, fuel efficiency, technology innovation and other critical programs and investments in our nation's future....while they preserve substantial subsidies to corporations and tax cuts for the rich. Now more than ever we need a president who can protect America's interests abroad while protecting the elderly, the children, the sick, the poor, the environment and culture here at home. We need a passionate, effective leader. To be sure, many Democrats have lost faith in Obama's ability to be that leader. Campaign promise after campaign promise has been broken, and the president's decisions seem more designed to ensure his re-election--by making independents happy--than by delivering on his promises to those who put him in office the first time around. Even Republicans are surprised to see the supposed "most liberal president in history" embrace the center so comfortably. The only real thing this president seems to stand for is his own legacy. That's why he wasted a year of precious political capital on health care reform (in which he caved under pressure and abandoned its central element, the public option) instead of job growth and the economy, and is now bragging about budget cuts. In the process, Obama's turned off those he will need most in 2012. Progressives. Seniors. Blacks. Young people. Gays. Teachers. Union workers. Artists. All those once-loyal Obamacons who gave their hearts, their souls, their money, their time and ran to the polls to give him the delegates he needed to occupy the Oval Office. Millions of them will run no more for Obama. They've grown dejected and disillusioned, as evidenced by the president's low approval ratings which average in the mid-40's. All of this could spell disaster for Obama, and the party, in 2012. But they're not ready to give up hope just yet, Secretary Clinton. Not ready to give up on the Democratic Party. There's at least 18-million people out there who'd passionately support you yet again. And the truth is, there are many of those 17-million Obama voters who'd shift their votes to you in a heartbeat should you challenge him in next year's primaries. If you run, Democrats will run right behind you. Secretary Clinton, fate is knocking on your door. Your time has come. And that time is 2012, not 2016. If a weakened Obama should lose to a Republican next year, and that incumbent Republican benefits from a strengthening economy and jobs market, 2016 may be a fait accompli for the GOP. That would mean 2020, when you'd be 72, would be your next real opportunity. While I think being the first woman president would be an amazing historical feat to accomplish--just as Obama became our first black president--I don't think being the oldest elected president is as appealing to you or to voters. Your best shot at the White House is now. And it's when your party, and your country, need you most. I understand and appreciate that it's not customary for a top politician, especially such a high-profile cabinet member, to run against her party's sitting president. But this is about country. It's about doing what's right for Democrats and the agenda we so desperately need to protect from further erosion and Obama sell-outs. 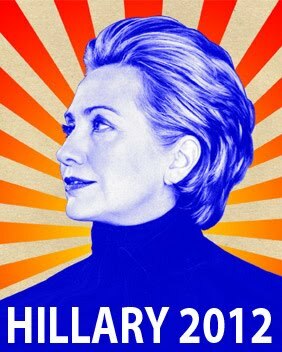 Hillary, America needs you. Please consider our urgent call for 2012. Thank you on behalf of Americans everywhere. Sorry. You totally lost me here. What is going on in DC is not such a simple idea as to get rid of Obama. All this would do is hurt the party. Maybe you are too young to know what this type of thing did to Jimmy Carter's re-election bid. It split the party which hurt his campaign big time. She would be more of the same BS - We need Kucinich for real change. Anyone else is just a corporate lapdog. Hillary is a neoliberal, neoconservative militarist-interventionist with DLC credetials, just like Bill. We need TRUE progressives to challenge the Two-Party Corporatist-Militarist Ruling Class, instead of going around in the same suicidal circles! What? More of the same? Again?! I don't know which is worse, a DINO Obama apologist or a DINO Clinton apologist. DINO Bill Clinton helped the Republicans deregulate the big banks, which is what caused the housing crisis. DINO Bill Clinton also helped to institute free trade treaties that stole US manufacturing jobs and sent them to third world countries. DINO Hillary Clinton will not be much different if she gets "selected". This is evidenced by here criminal behavior under DINO Obama. What we need is a true Progressive Democrat to challenge DINO Obama, not another DINO. In next years' Democratic Primaries, vote out all DINOs. Vote only for Progressive Democrats. Anon 11:39....do you understand how the nomination process works? Clinton and Obama would run against each other. One would win. And that person would run against the Republican. There is no "splitting tickets." The only issue here is whether you want Obama OR Clinton facing the GOP candidate. The person didn't say "split the ticket," they said "split the party." Do you understand how the election process works? A primary battle can split and therefore weaken the party, it has nothing to do with who is the eventual nominee. Anon 827...I'm not sure I get your point. Isn't a primary exactly the place where a "battle" is supposed to take place? Do you think that we should do away with primaries? DO you think that only opponents who are meaningless and stand no chance should run against a more prominent candidate? I'm not really sure what you're suggesting. How about just telling us what your problem is with having a "primary battle"...when that is exactly what the system is designed for. I've been begging an ACTUAL liberal o challenge O-Bush-ma since it became obvious in the Spring of 09 that he is just another corporate stooge, but Hilary???? She's a bigger right wing corporate sell-out nutjob than O-Bush-ma. We need a REAL liberal. Anthony Weiner, Alan Grayson, Debbie Wassserman. I understand exactly what Anon 827 is saying...and agree. Besides like the other people here have posted we don't need another da*n corporate Democrat , we already have one!!! My question is simply: "why would we want to replace one Republican pretending to be a Democrat with another Republican pretending to be a Democrat?" Hillary might be a little forceful than Obama, but the effect would still be the return of the DLC. The alternative (according to the joke going around DC) is that Hillary should give Obama one of her testicles. That way they would each have two. Running against a Democratic President in a primary does not necessarily weaken the party. Jimmie Carter did not lose the 1980 election because Ted Kennedy ran against him. He lost because he couldn't get the hostages held in Iran home. And he couldn't get them home because the Reagan/Bush team committed high treason by negotiating with Iranians to hold the hostages. Likewise, I think it's fairly safe to say that Robert Kennedy would have won the 1968 campaign against Nixon had he not been assassinated despite the fact that he and Eugene McCarthy forced LBJ out in the primaries. This is a perfect example of what the Obama campaign did to the Democratic Brand in 2008. His praise of Ronnie Reagan when it was Bill Clinton who gave us the most prosperous period of our lifetime brainwashed over half of new voters who now think like FOX news and have no idea what they are talking about. BTW, it was Kucinich, who after a big boy ride on Air Force 1 gave in and voted the Public Option otherwise referred to as UNIVERSAL HEALTHCARE into the dustbin for all time. There's more to our government than little soundbites from MSNBC. You can tell those that watch that channel. They repeat the talking points often.